While the economic consequences of financial insecurity – from limited socioeconomic mobility to increased risk of eviction or foreclosure – are well documented, research focusing on the impact that financial insecurity has on the civic behaviors of families and communities is less extensive. The connection between financial insecurity and civic engagement is important not only because of its direct impact on the quality of democratic participation, but also because of its ability to shape policy outcomes that include financially insecure communities or that leave them behind. Research in this area indicates that financially insecure communities tend to engage the formal political system far less than their financially secure counterparts. In a 2015 report, “The Politics of Financial Insecurity: A Democratic Tilt, Undercut by Low Participation,” the PEW Research Center examined political participation in relation to financial security, which was measured by access to checking, savings, and credit accounts; retirement savings; financial stress; and receipt of means-tested benefits. The Center found that 94 percent of the most financially secure Americans reported being registered to vote in 2014, relative to 54 percent of the least financially secure. In the 2010 midterm elections, 69 percent of those most financially secure cast ballots, relative to only 30 percent of the least financially secure. This pattern follows for other forms of political engagement, including contacting elected officials, donating to political campaigns, and knowledge of the political system. The impact of financial insecurity on civic engagement is a pressing issue for the Mid South, where access to financial services is notably low and poverty is equally high. The Prosperity Now Scorecard is a tool that measures the financial and economic well-being of states, using indicators of financial services access, asset and income poverty, and credit access. Each of the states served by Hope Credit Union ranks in the bottom 15 of the 51 states included in the Scorecard. Mississippi, Louisiana and Arkansas are in the bottom six. Moreover, this financial insecurity is disproportionately experienced by people of color and women. In the states served by Hope Credit Union, approximately 58 percent of African Americans are either unbanked or underbanked, compared to only 26 percent of white households. 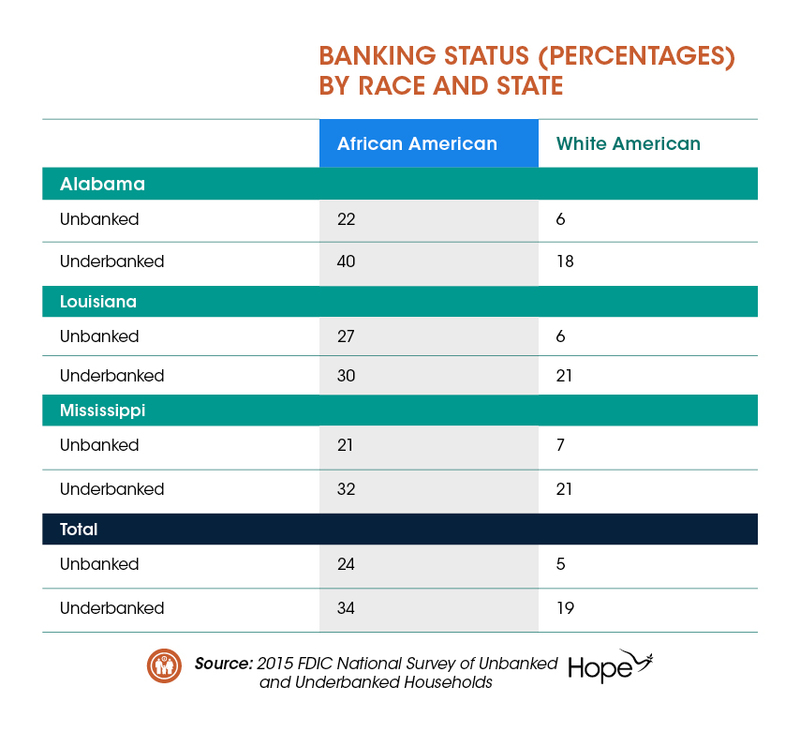 In each of these states, African Americans are between three and four times as likely as their white counterparts to be completely unbanked. See Table below. Female heads of household in the Mid South are also at greater risk of experiencing financial insecurity. 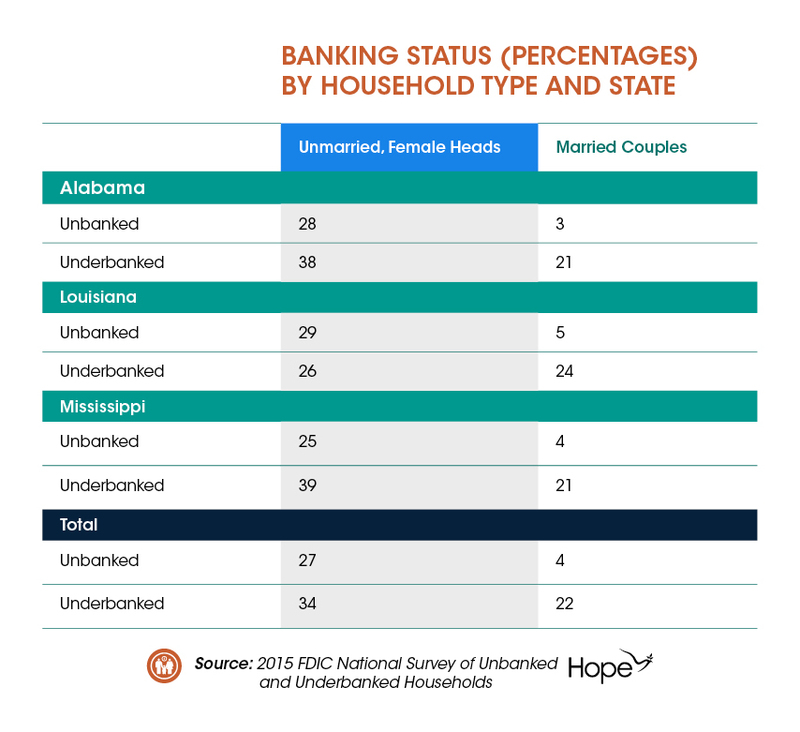 In the states served by Hope Credit Union, approximately 61 percent of unmarried female-headed families are unbanked or underbanked compared to only 26 percent of married couples. Single women in these states are between six and nine times as likely as their married counterparts to be completely unbanked. See Table below. The policy implications of high levels of financial insecurity in the Mid South are clear: public policy processes and outcomes do not adequately support financially insecure communities, particularly those of color and those that have high levels of female-headed households. The states served by HOPE Credit Union have adopted, on average, only 30 percent of the policies recommended by Prosperity Now to help families build and maintain financial security. These policies range from protections against predatory lending to adequately funding financial aid at postsecondary institutions. Community Development Credit Unions offer a promising strategy for reducing racial and gender equity gaps in financial security. Increasing financial access for the most marginalized not only reduces financial insecurity, but may improve levels of civic engagement among the financially insecure, resulting in more equitable public policy. In this context, HOPE’s work is vital given its ability to improve economic outcomes directly, through the provision of financial services, and indirectly, through increasing the political participation of the financially insecure. Eighty percent (80%) of HOPE’s branches are located in high-poverty communities where the need for wealth-building financial services is greatest. As a result, nearly 40 percent of HOPE’s members were unbanked prior to opening their account. The product suite that HOPE provides is targeted to the financially insecure such as the Borrow and Save Loan program. HOPE participates in National Voter Registration Day by hosting HOPE for Our Future, a voter registration drive at various credit union branches. These kinds of programs can help improve the economic and democratic health of Mid South communities.